After 15 years in sled dogs I joined forces with Mary in 1993. 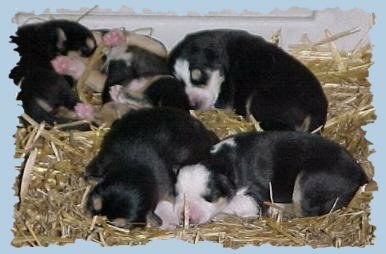 In sled dogs our goal was to raise well bred racing dogs in the absolute best way possible. To produce sled dogs that could race on top teams in any venue. Our home near Chatham, Michigan adjacent to the 250 thousand acre Hiawatha National Forest suits this perfectly. Our breeding program focuses on dogs off top teams in major races across the world. 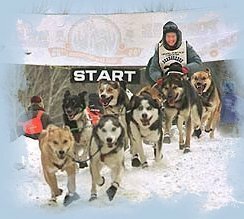 Races such as Iditarod, Yukon Quest, Fur Rendezvous, Open North American Championship and the John Beargrease Sled Dog Marathon. We raise our pups with lots of attention. They are most often handled in the first few hours of their life. We will bring pups into our home in their first few days of life to expose them to the sounds, and smells of human activity. They are taken for twice daily walks from the first day they can walk and free run behind a ATV when they get a little older. They meet lots of people of all ages. They are first harnessed at around 6 months of age and then run consistently to insure the best possible start towards life as a sled dog. All of our dogs receive the very best in the way of nutrition and care. Our focus has been mid and long distance racing and more recently stage racing. We have sold dogs to many top racers in dramatically different areas of the sport. Faxon is a ¼ pointer that we sold to Jan Bootz Dittmar that led her ISDRA Gold Medal team in 2003. She also had two yearlings in that team fathered by our stud dog Ram. 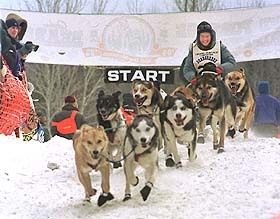 Therese finished her fourth Iditarod with Ramy Brooks in his second place team of 2003. Therese was raised at our kennel in 1996 and we still have her littermate brother Goose who has been a great stud dog and top performer for us. If you are working towards winning races or just want to have fun and go camping with some of your own dogs take a look at what we have to offer. Our goal is to match dogs and mushers. Mary at the Start of Beargrease!